So, I just came across the meme On My Wishlist, hosted by Book Chick City. I like the idea of this meme, and hope to participate in it weekly. I have a pretty large selection of books on my PBS wishlist and reminder list combined. I hope to be able to share 1-3 books each week. With Beauty Killer Gretchen Lowell locked away behind bars once again, Portland detective Archie Sheridan can finally rest. Meanwhile, the city of Portland is in crisis. Several people have drowned in heavy rains that have flooded the Willamette River. But the medical examiner discovers that in fact the latest victim was poisoned before she went into the water—she didn’t drown. A little detective work shows that so far three of those previously thought to be accidental drownings have actually been murdered. Portland has a new serial killer on its hands, and Archie and his task force have a new case. Meanwhile reporter Susan Ward is following up on an entirely separate mystery: the dramatic flooding has unearthed a skeleton, a man who might have died during catastrophic flooding more than sixty years ago that washed away an entire neighborhood and killed at least 15 people. As Archie follows the bizarre trail of evidence and evil deeds to catch his killer, he has to battle the rising waters of the Willamette first. And second is a book that I’ve had my eye on for quite some time. What do you get when a woman who’s obsessed with death and U.S. history goes on vacation? This wacky, weirdly enthralling exploration of the first three presidential assassinations. Vowell (The Partly Cloudy Patriot), a contributor to NPR’s This American Life and the voice of teenage superhero Violet Parr in The Incredibles, takes readers on a pilgrimage of sorts to the sites and monuments that pay homage to Lincoln, Garfield and McKinley, visiting everything from grave sites and simple plaques (like the one in Buffalo that marks the place where McKinley was shot) to places like the National Museum of Health and Medicine, where fragments of Lincoln’s skull are on display. 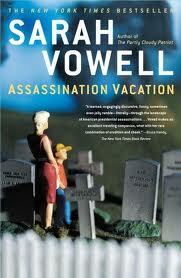 An expert tour guide, Vowell brings into sharp focus not only the figures involved in the assassinations, but the social and political circumstances that led to each-and she does so in the witty, sometimes irreverent manner that her fans have come to expect. Thus, readers learn not only about how Garfield found himself caught between the Stalwarts and the Half-Breeds, bitterly divided factions of the Republican party, but how his assassin, Charles Guiteau, a supporter of the Stalwarts and an occasional member of the Oneida Community, “was the one guy in a free love commune who could not get laid.” Vowell also draws frequent connections between past events and the present, noting similarities between McKinley’s preemptive war against Cuba and the Philippines and the current war in Iraq. This is history at its most morbid and most fascinating and, fortunately, one needn’t share Vowell’s interest in the macabre to thoroughly enjoy this unusual tour. 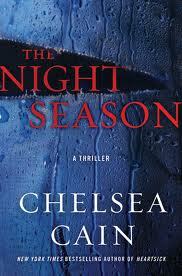 I’ve been eyeing the Chelsea Cain books for a while now, but haven’t actually read them yet. They sound very interesting though. Hope you get these soon! Love the sound of The Night Season – haven’t heard of this series before!